Uberchord is an app for iOS, featuring not just didactic guidance but also a few other nifty ideas. Although Youtube can offer a wealth of information and lessons for the budding guitarist, many learners come inevitably to the point where they rue having never had their bad habits addressed by a real teacher. 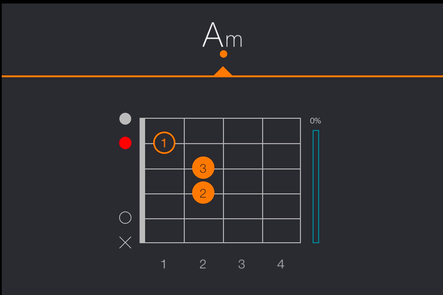 Enter Uberchord, an app which can actually listen to the guitarist and correct them in real time. This is the beginning of the future. 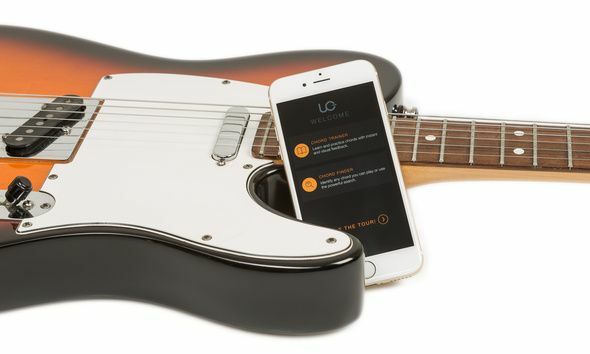 We are curious about what separates Uberchord from the countless other guitar tools out there. How can the app detect, register and process the sound of a real guitar, and how much application does such a tool really have? Uberchord Engineering is a German firm based in Berlin. Co-founders Eckart Burgwedel and Simon Barkow-Oesterreicher began working on their idea for a guitar learning app as early as 2011. Wanting to rise above the competition, they focused on creating a pedagogic tool offering real-time feedback, combined with playful elements seen in game design. 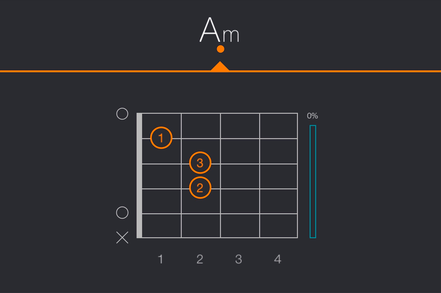 The app was made to function ‘acoustically’ – without the need to plug in the guitar via an adaptor. The challenge was set, and after two years of hard work the team finally submitted their chord-recognition technology for patenting, and the foundation of Uberchord Engineering was laid. 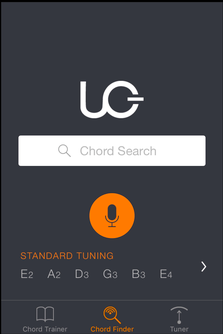 The Uberchord app is currently being tested across its two main features: Chord Trainer and Chord Finder. Chord Trainer provides various exercises for different skill levels. The magic of Uberchord rests on its chord detection software. The user plays the chords which are displayed on the screen. 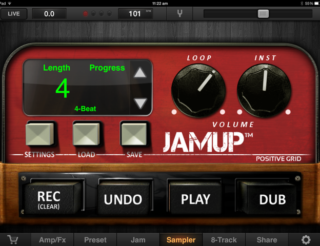 The app listens, either over the device’s microphone or through a guitar jack via iRig, and will correct the guitarist if he incorrectly fingers a chord. The microphone and soundchip in the device are incredibly important, and are the reasons why Uberchord can currently only offer the app on iOS. The Apple operating system extends to only a few lines of gadgets such as the iPhone and iPad. This ensures a certain consistency of quality in regard to the integral components of its devices, which an app like Uberchord is dependant on. Android devices however, are many and different, and a nascent company such as Uberchord simply would not have the resources to cater for all potential configurations of hardware. Accordingly, Uberchord have focused on one system. The app itself is free, offering a handful of in-app purchases. In the near future, the app also plans to offer a premium model. Currently Uberchord is running at about 10% of what it plans for the future, and what the technology affords. Uberchord doesn’t want to be constrained by chord training, and intends to expand into rhythmic exercises for the right hand too. Song practice is also in the works, although issues concerning rights and royalties must first be negotiated. Here goes. We start a quick run-through and promptly check the famed chord recognition ability of our new virtual guitar teacher. 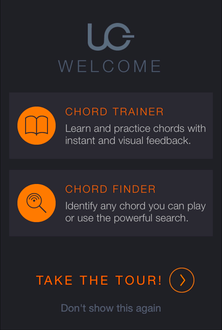 Opening the app yields the binary choice between Chord Trainer and Chord Finder. 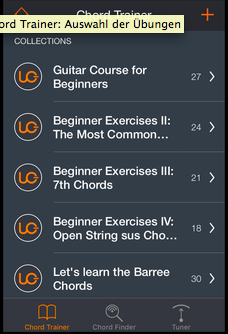 We begin with Chord Trainer and arrive at a page with several different exercises. Under the title ‘Beginner Exercises II: The Most Common Chords’ we find twenty-four different chord exercises, which also incorporate open strings. I pick Number 24; Hotel California and up pops up a screen overviewing the diagrams of all necessary chords in the song. We press the play button to start the exercises. Uberchord displays the first chord – in this case an A minor, which must then be strummed. 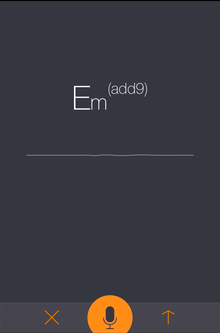 If the app hears the chord played correctly, the next chord is then shown, and so on. We are corrected in real time if we make a mistake. This time round, I am using an acoustic guitar, and the app picks up on every mistake mercilessly. With a direct connection via guitar cable, I’m told the app is even more precise. The performance through the microphone is nonetheless astonishing, especially if one takes care to reduce background noise to a minimum. To the right of the chord diagram is ‘Chord Mastery’, which displays how consistently you’ve been nailing the chord exercise. 100% mastery is reached after you successfully play the same chord 150 times. This allows one to track his progress over time. Similar to a sports app, all progress on Uberchord is logged and the statistics can be called up through the chord diagram. The exercises aren’t limited to what’s already on the app. With the Song/Exercise Editor it is possible to create your own songs and exercises for use in the app. There’s also a handy feature to share these with other Uberchord users. Now to the Chord Finder feature. Many self-taught guitarists play according to their ear and have a vast array of different chords under their fingers. They may not however, have the academic knowledge to explain these chords to others. The Chord Finder analyses and identifies what you’ve played, meaning you can impress your keyboardist by explaining how the chorus to your new songs begins with an E minor (add 9). This feature works quickly and smoothly. 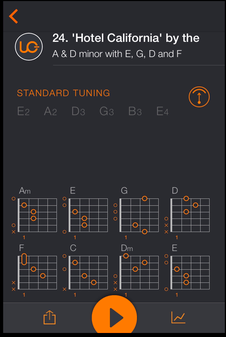 We press the microphone button, strum a chord and the app reveals what we’ve just played along with a helpful diagram – impressive, no doubt. There are occasionally minor difficulties in audio recognition for chords featuring lower strings, but the success rate is still very high indeed. For that alone the app is worth downloading. After the chord has been recognised and you’ve pressed the arrow-symbol, more information is readily available on the tones of the chord and all of its inversions. Hopefully this will help when your annoyingly well-educated keyboardist throws out unsolicited advice on voice leadings. If a valued bandmate says that a Cm (maj 79) would be just perfect for a song in question, then the Chord Search function again proves its worth. 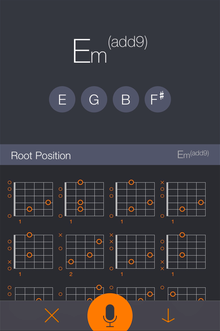 We simply enter the name of the chord into the app and at an instant can see diagrams depicting the chord spread across all positions on the fretboard. Until now we’ve only played in standard tuning, although our digital guitar teacher also has other variants to offer. 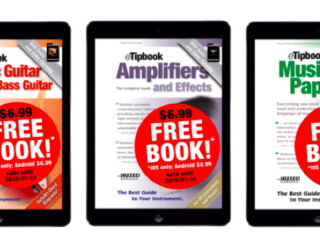 Standard and Open D are free, but others are available to buy for 99 cents as an in-app purchase. At the time of the test, these amount to 17 different tunings. Here are all the common open tunings such as Drop D, Open G, Open E and also some somewhat more special ones like Open G Minor or Open E Major 7. This is a fiddly job, as every new tuning radically affects the names and searching of chords. For that purpose, 99 cents is a small price to pay for quite a sensible investment in your guitar education. Awesome! The Uberchord app works superbly. Its programmers have truly delivered a wonderful piece of work. A ringing chord from a guitar is registered through the device’s microphone. At this point, Uberchord’s patented Chord Trainer provides immediate visual feedback on whether the chord is being played correctly or not. Certainly there were moments where the software didn’t correctly identify the chord, especially those featuring the thicker, bass strings. Generally however, the success rate lay around 90%. Ultimately, it would be wrong to complain considering the app is free of charge! In addition, Uberchord comes furnished with a vast library of chords which are displayed in every position. As a result, searching for chords is an incredibly easy and quick process. Using its audio recognition software against this huge chord database, Uberchord is also deft at identifying any new or strange chords that you may stumble upon. We cannot recommend this enough for iOS users! 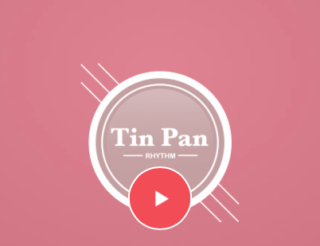 As a 99 cent in-app purchase, users can also buy the support for additional tunings. Uberchord is being constantly refined and expanded. We can only be excited for whatever new developments the Uberchord team will cook up next! Thanks again Bonedo for the review. If you want to see the original review published in German, you can check it out here.